I hadn’t done much cooking during the week, with dinners out and social gatherings, so I had big plans to use up a lot of ingredients on Friday night. It was to be a “cook the pantry” type of night. Then it got to be 8:30pm before I started. Why so late? Well, there was some drama in discovering that one of our cats was refusing to eat the dry food we had always fed her, so there were two trips to Petco to find alternatives. Then I was so sleepy that I tried to take a preliminary power nap. And one of the floors desperately needed to be vacuumed, and that needed to be done before too late so as not to disturb the neighbors. So, I didn’t have time to cook everything I wanted before bed. Fortunately, there was time on Saturday too! I was facing another batch of swiss chard, so I decided to try something a little different. Why not puree it? 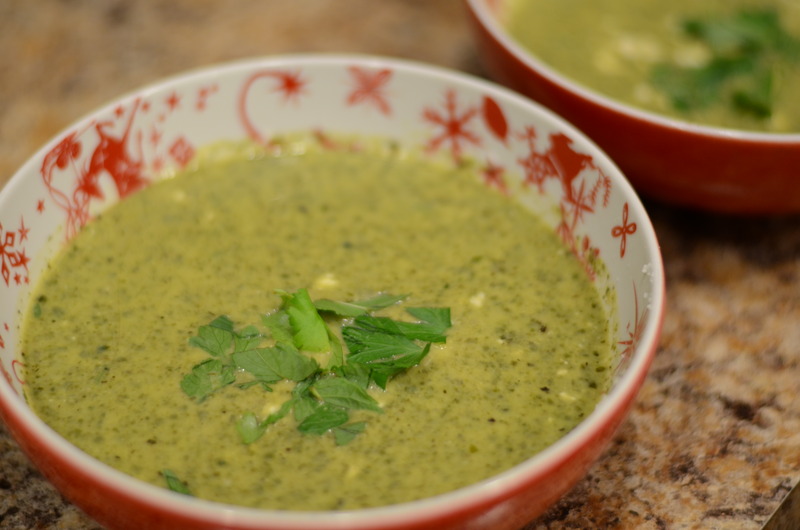 This soup recipe was great because it also utilized parsley, which I received in the farm share at the same time it happens to be thriving in my garden. With the added tang and creaminess of lemon juice and greek yogurt and the salty zing of feta, we had a pleasant summery soup on our hands. I’m not sure why the Bon Appetit recipe refers to this as a winter soup. 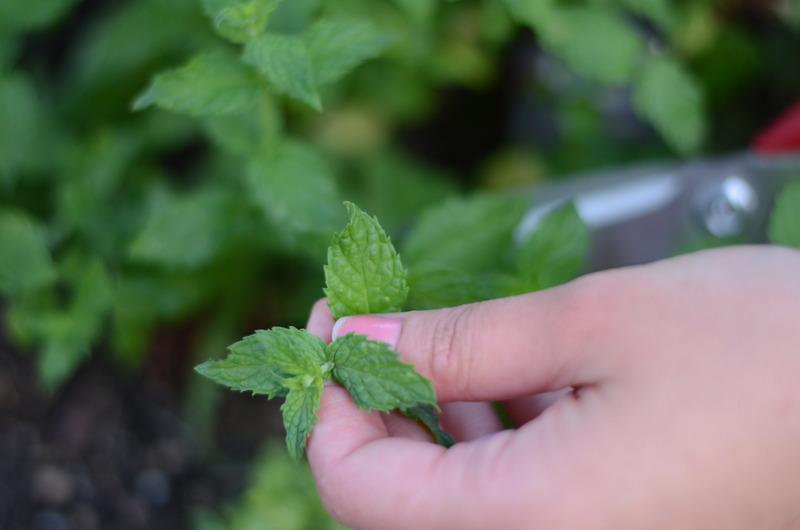 Unless you have your own green house, the fresh herbs would be a big investment at the grocery store during the winter. I’m certain you could substitute spinach in this recipe, but there is no substitute for the fresh herbs. Heat oil in a large saucepan or dutch oven over medium heat. Add onion and garlic and cook, stirring often, until translucent and soft (do not brown), 7–8 minutes. 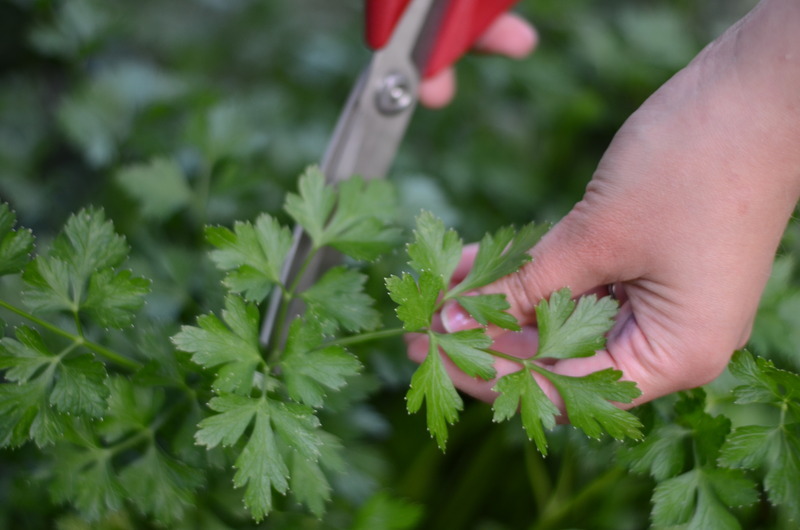 While they cook, roughly chop your herbs. 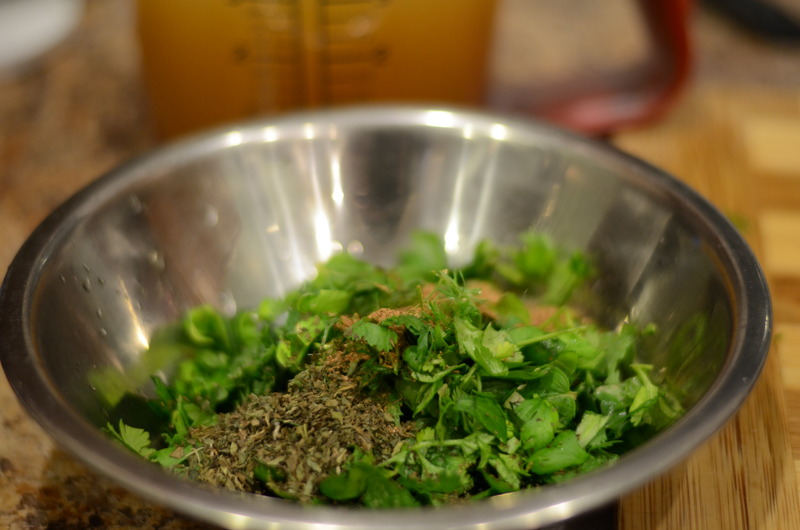 Add chard, parsley, cilantro, fresh and dried mint, nutmeg, and broth to the pan. 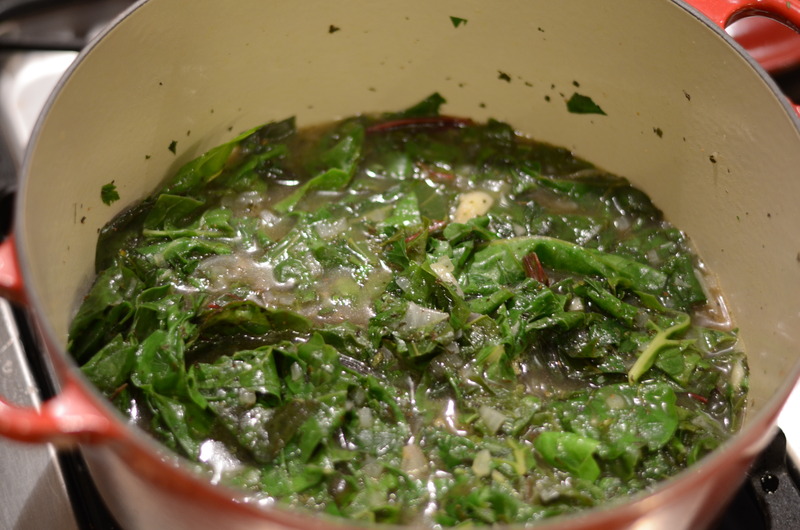 Bring to a boil, reduce heat, and simmer, stirring occasionally, until chard is tender, less than 10 minutes. 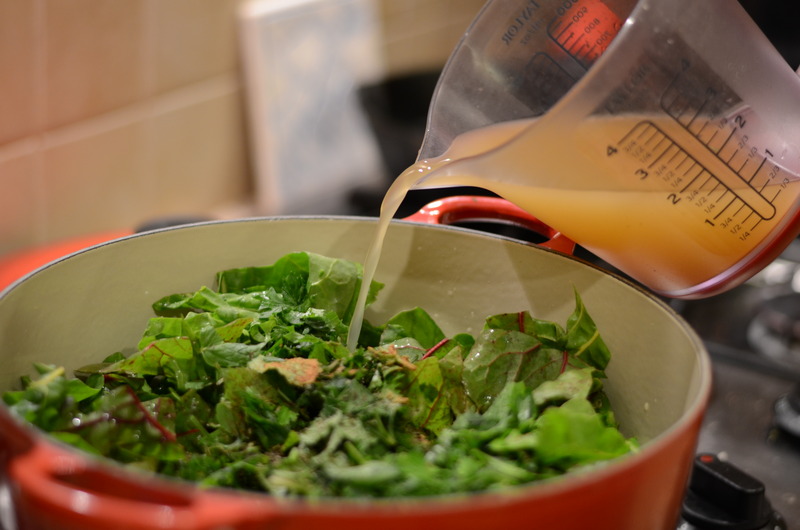 …..and then the chard shrinks! 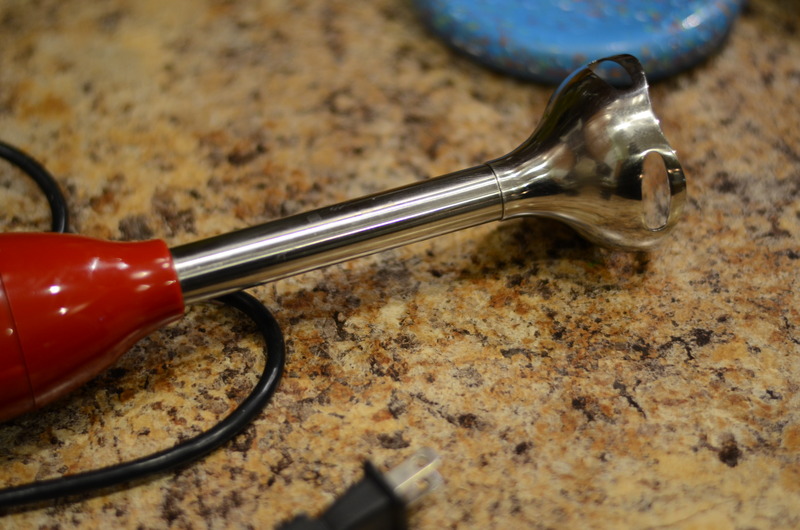 Take out your immersion blender tool and go at it. I like the idea of an immersion blender because it is very easy to clean compared to a food processor or blender. Yet it makes a mess with its splattering. Even with an apron, I don’t recommend wearing dry-clean only clothes with this one! Especially if you want your soup really really smooth, you could purée it in batches in a blender. Return to pan. Place a few Tablespoons of the yogurt in a separate medium bowl. Add a ladle-full of warm soup and whisk until smooth. Repeat process twice more, using the yogurt and adding a total of 1 cup more soup. Whisk yogurt mixture into soup in saucepan. Stir 1/4 cup herbs and about 1/4 cup of crumbled feta into soup. Season to taste with lemon juice, pepper, and salt, remembering that you will be garnishing with additional feta–and my feta at least was very salty. Ladle soup into bowls and garnish with herbs and feta. Drizzle with oil, if desired. Serve with a good crusty bread, ideally. 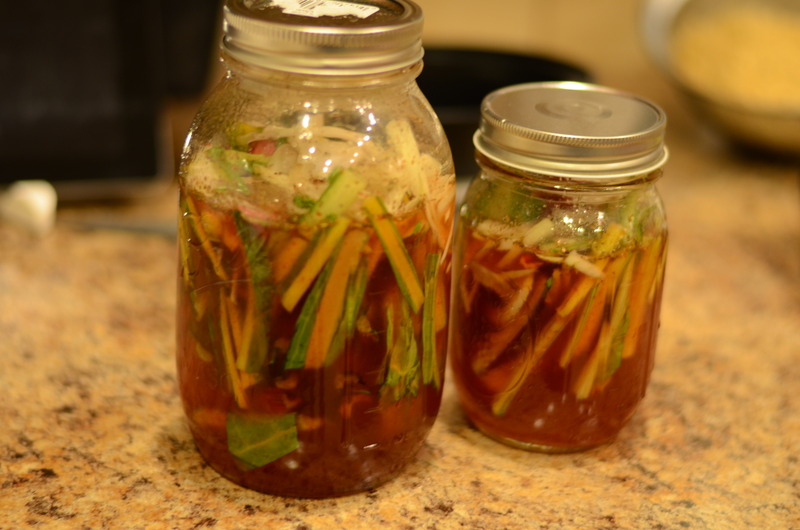 I had almost 3 Cups of leftover swiss chard stems, which I saved from disposal and pickled using this Bon Appetit recipe as guidance. I didn’t quite double the recipe–I ended up using about 3 Cups of Sugar, 1 3/4 Cups white vinegar, 4 Tablespoons Siracha, and 3/4 tsp of celery seed. Since they are supposed to sit for a few days, I have no idea how they will turn out, but I’ll let you know! 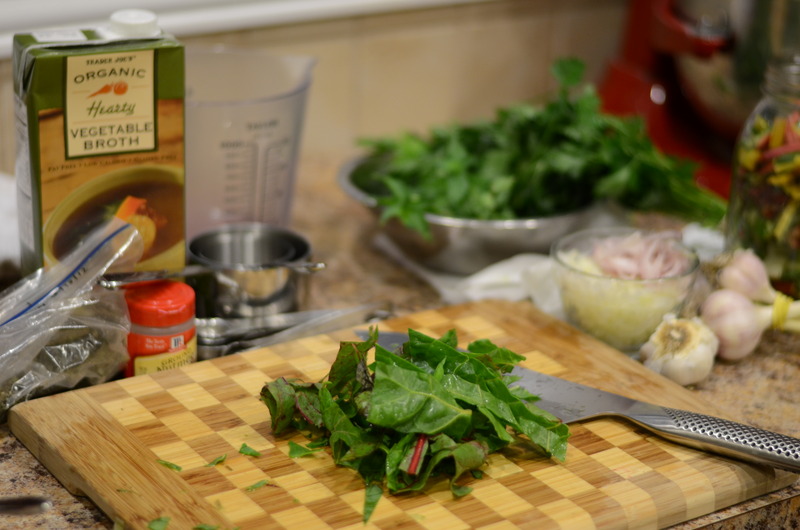 This entry was posted in Fresh Herbs, Greens, Recipes and tagged herbs, swiss chard, vegetarian. Bookmark the permalink. That does look hearty. Great photography!